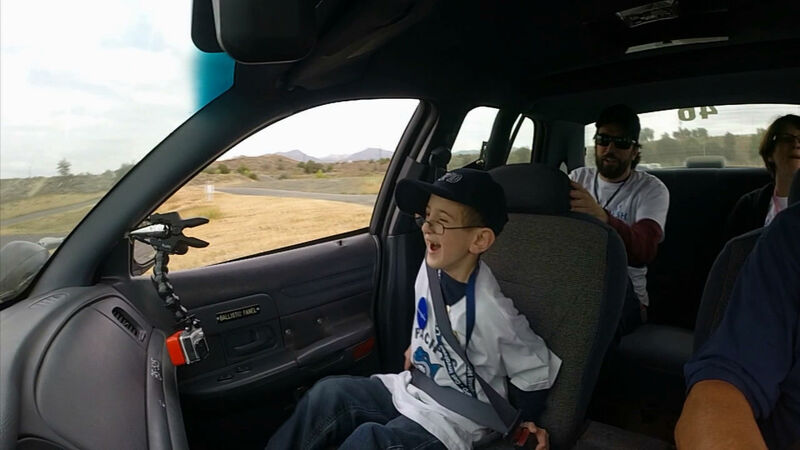 An 8-year-old boy manned a police driving simulator, took part in a high-speed pursuit and flew air support in a police helicopter during his amazing Make-A-Wish adventure. LOS ANGELES, Calif. -- Noah Cohen has plenty of bad days, but Thursday was not one of those days. The 8-year-old born with a rare series of birth defects spent the day fulfilling his dream: protecting and serving the city of Los Angeles. With the help of the Make-A-Wish Foundation, Cohen flew from Vermont to Los Angeles to work with the Los Angeles Police Department. He manned a police driving simulator, took part in a high-speed pursuit and flew air support in a police helicopter. "This is the ride of my life!" Cohen said. Cohen's has undergone 24 surgeries over his life, spending huge amounts of time in hospitals and operating rooms. That's when he got hooked on reruns of the old 1970s show "Emergency" that inspired his adventure. He and his family landed in Los Angeles Wednesday, and the TV make-believe became a reality. "We were spinning around in a cop car and then I got to arrest the suspect!" Cohen said. Cohen even got a chance to meet LAPD Chief Charlie Beck, strategize with the SWAT team and chase after bad guys. "Hopefully we've given Noah an experience he'll never ever forget, neither him nor his family," LAPD Capt. Vic Davalos said. It was an ear-splitting, tire-screeching, high-flying Make-A-Wish adventure. While the honorary LAPD helmet was eventually removed, it's hard to imagine Cohen's smile ever coming off.